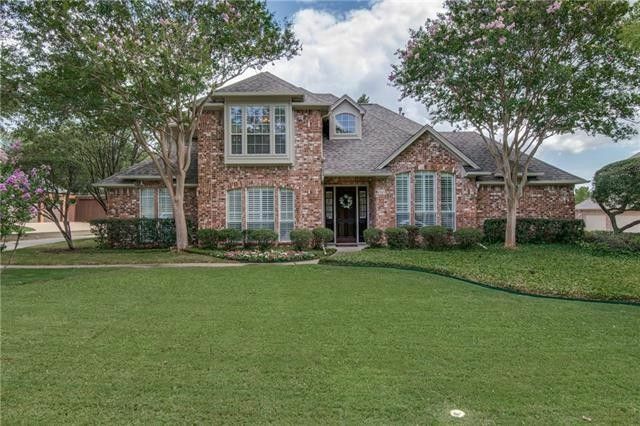 This custom brick Forrestridge home offers 4 big bedrooms, 3.5 baths, 3 living+2 dining areas, a 41X21 garage-shop & a gleaming gunite pool. UPDATES include freshly painted walls & kitchen cabinets, granite countertops, stainless steel appliances & stunning wood floors. The secluded 1st floor master suite has access to the 26X11 covered patio & pool view. The 1st floor guest suite with full bath is an added bonus! The upstairs gameroom is flanked by 2 big bedrooms that share a Jack-N-Jill bath. INCREDIBLE STORAGE:all bedrooms have big walkin closets; the garage has a wall of cabinets; big secluded backyard storage building.Total privacy in the oak-shaded back yard with lots of play area, a gazebo & koi pond! Directions: From I-35 turn south onto Teasley Lane. Turn right onto Hobson Lane, and left onto Forrestridge Dr. Turn right onto Wellington Oaks Circle. Areas Served Denton, Corinth, Southlake, Trophy Club, Highland Village, Argyle, Flower Mound, & More!